1. Students must complete the Free Application for Federal Student Aid (FAFSA) for the award year in which they are applying. The FAFSA must be completed and on file in the Office of Financial Assistance before any scholarship can be awarded. 2. Scholarship applications must be submitted online via MYHSSU by the stated deadline. Incomplete applications will not be reviewed for consideration by the scholarship committee. 3. Recipients of renewable scholarships must be continuously enrolled and also meet all of the stated criteria to receive the scholarship for each semester and or academic year. Failure to comply with the requirements of the scholarship will result in termination of the award. 4. All institutional awards are based on the in-state tuition rate. 5. Unless otherwise specified in the scholarship, funds in excess of the charges to a student’s account will not be refunded to the student. If a student’s scholarship exceeds the cost of attendance (tuition, fees, etc. ), aid will be reduced in the following order: Federal and or private loans, institutional scholarships, external scholarships, third party scholarships, state grants and federal grant aid. 6. Textbook assistance granted through scholarships and/or awards can only be utilized in the Bookstore located on the Harris-Stowe State University campus unless otherwise stated in the scholarship. 7. Scholarships and/or awards cannot be transferred to any other college or university. 8. Decisions of the Scholarship Committee are final and cannot be appealed. First-time freshman and transfer student scholarship opportunities are available through HSSU's Office of Admissions. Questions regarding these scholarships may be addressed by contacting them directly at (314) 340-3300 or via email at Admissions@hssu.edu. 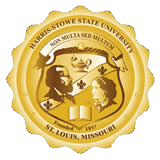 External scholarships (also known as "outside scholarships" or "third-party scholarships") are distributed by a third-party, Harris-Stowe State University is unable to provide any additional information regarding the selection process, the notification process, or the disbursement process of these opportunities. If you are applying for any of these scholarships, please be sure to inquire with the scholarship donor for additional information. Click on the link above to be directed to external scholarships available exclusively to students in the St. Louis Metropolitan area.